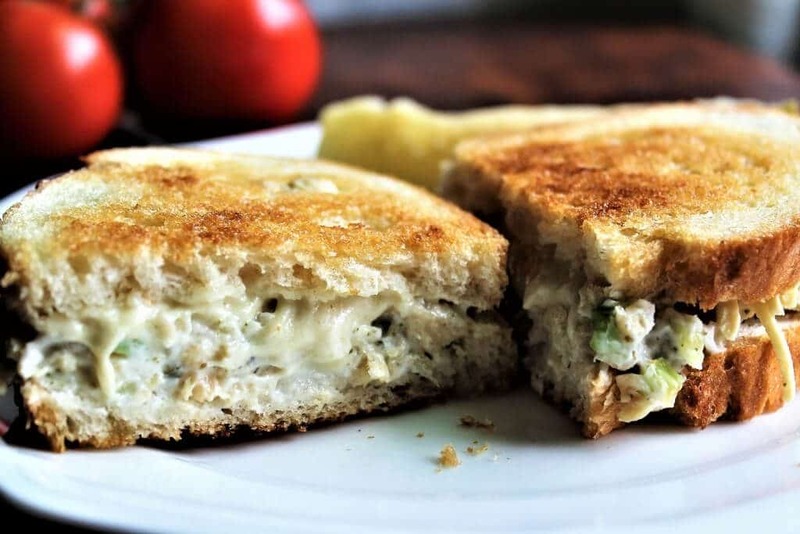 You are here: Home / Lunch / Vegan Tuna Salad – Make a Vegan Tuna Melt! 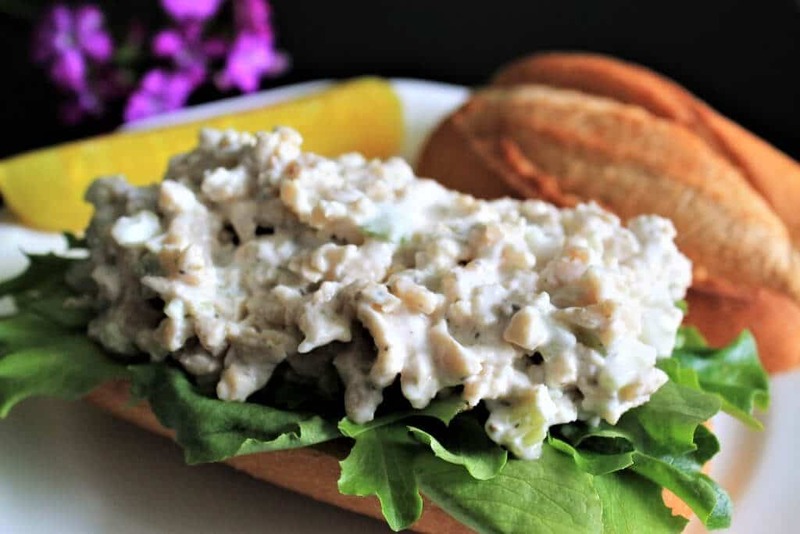 This vegan tuna salad can be made into a vegan tuna melt or use in a tuna salad sandwich. It’s creamy, delicious comfort food without the fish, eggs, or cholesterol! A tuna sandwich is one of those things that reminds me of my childhood, and for some reason, I just feel like my vegan kids need to know what one tastes like as well. Does this recipe use chickpeas? No, this is not one of those chickpea tuna recipes. I have seen a lot of recipes floating around for chickpea “tuna” salad sandwiches. They are delicious. I make them as well, however, I craved the taste and texture of that classic tuna sandwich that I ate as a child. I fiddled around with ingredients and proportions until I came up with something pretty darn close to the taste and texture that I remember! What do you use instead of chickpeas? I used TVP (textured vegetable protein) for the “tuna.” It is a dehydrated soy protein that absorbs the flavor of whatever you re-hydrate it in. 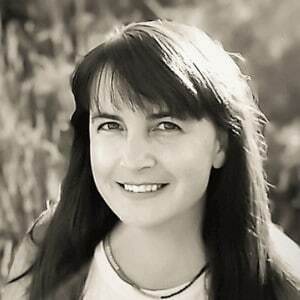 (You can usually find TVP easily at any natural foods store or most major grocery stores in the Bob’s Red Mill section). What other ways can I use this tuna salad? Put the tuna salad on toast, on a lettuce wrap, or eat it on crackers. Whatever way you choose, it will be delicious! How do you make vegan tuna salad? Make a broth out kelp flakes and salt and re-hydrate the TVP in the broth in to give it that fishy taste. Allow the TVP to soak up all of the broth and cool down a little. Add vegan mayo to the TVP mixture and some finely chopped celery if desired. Give it all a good stir and use as you would tuna salad. This vegan tuna salad can be stored in an airtight container in the fridge for 3-5 days. (However, my family always eats it up before it has a chance to go bad). You can use any store bought vegan mayo or you can make your own in about 3 minutes using my homemade vegan mayo recipe. 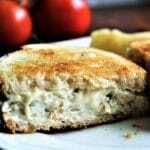 How do I make a vegan tuna melt? 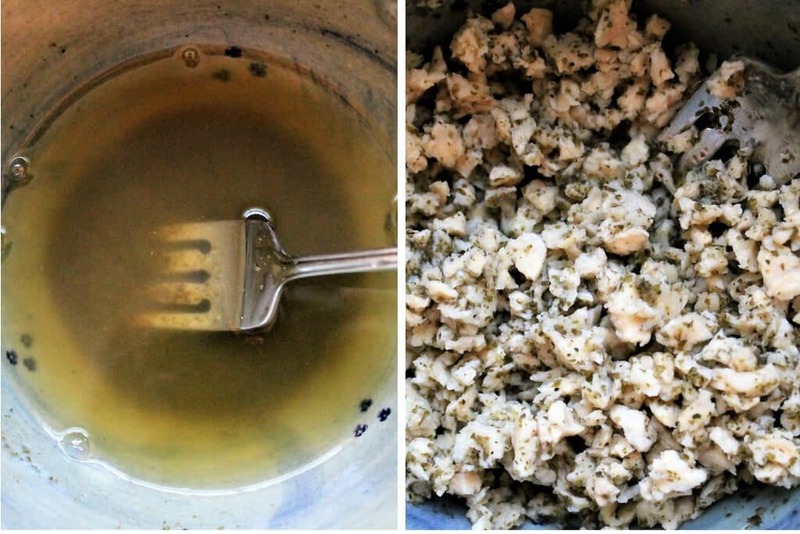 Make a sandwich with this tuna salad mixture and a slice of vegan cheese on it. Grill it on a skillet over medium-low heat until it’s golden brown and the cheese is melted. If need a great vegan cheese or you want more tips on how to grill a perfect vegan sandwich check out my post on a vegan grilled cheese sandwich. 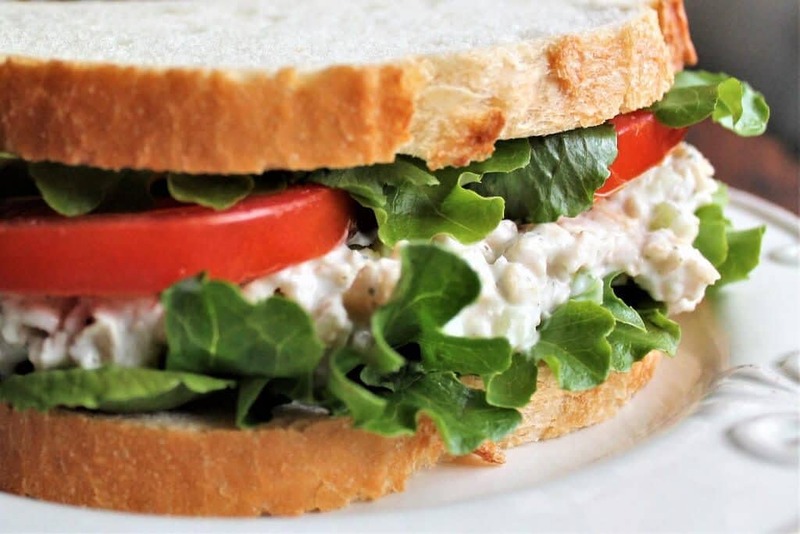 Need a gluten-free vegan tuna salad sandwich? The vegan tuna salad itself it gluten free. If you put it on gluten free bread, you will have a gluten free meal! Want another great sandwich from your childhood? Check out my Tofu Egg Salad! Don’t forget to pin the vegan tuna salad recipe for later! A vegan tuna salad made with TVP and kelp powder for an authentic tuna taste and texture. 1 Boil water and pour it into a bowl. Add the kelp flakes and salt then stir well. Add the TVP to the water and kelp mixture and stir. Allow it to sit for about 15 minutes until it absorbs all of the water and cools off. Add the mayo and mix well. Add celery and/or pickle relish if desired. Use as you would tuna salad. Store unused tuna salad in a sealed container in the refrigerator. Put 2-3 tbsp of tuna salad mixture and vegan cheese of choice between 2 slices of bread. Spread vegan butter on the outsides of the bread and grill in a skillet on medium low for a few minutes on each side until golden brown and cheese is melted. Make sure to allow the TVP mixture to cool before adding vegan mayo. To make a tuna salad sandwich, put sliced tomatoes and lettuce and 2-3 tbsp of tuna salad mixture between two slices of bread. Vegan tuna salad will keep in the refrigerator for 3 days. 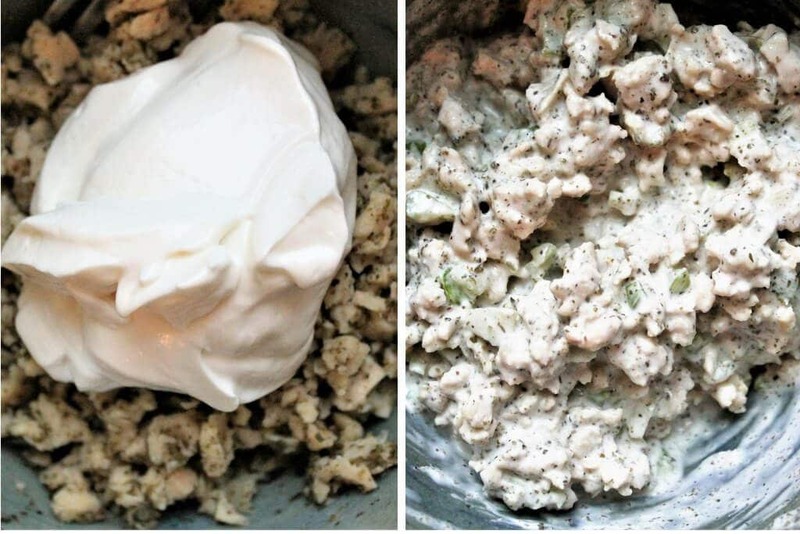 This is the closest tasting recipe to real tuna salad that I’ve tried!